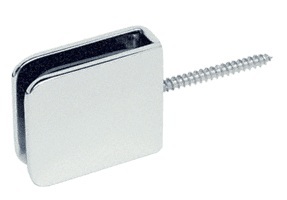 Square wall mount clamps are screwed directly to the wall, ceiling or floor in order to secure vertical fixed glass panels. Over glass clamps require no glass fabrication. Door Stop is for mounting on an inline 180 degree fixed panel to prevent the door from going into the shower enclosure. 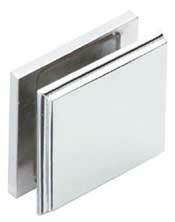 CRL Fixed Panel Square Clamp (With Small Leg) mount directly to the wall, ceiling or floor to secure vertical fixed glass panels. Clearance between the glass and wall is 3/16" (5 mm). 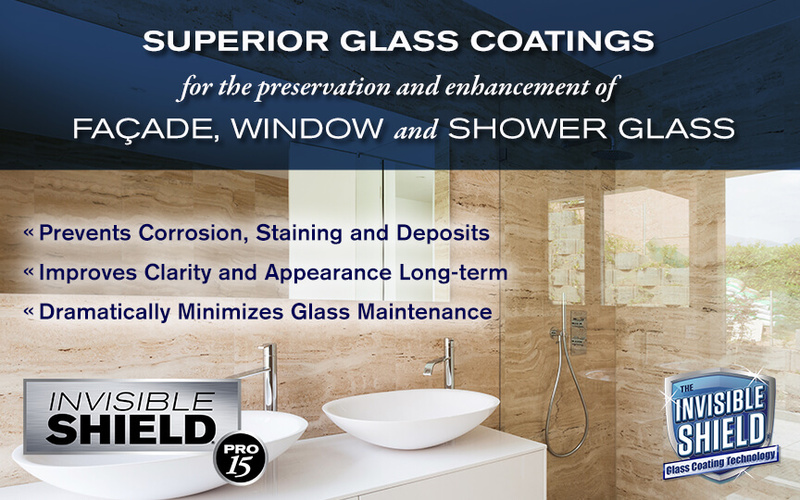 Clear silicone can be used to provide a clean, water-tight seal. 90 degree leg provides extra strength. 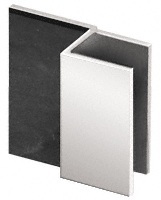 CRL Square 180 Degree Glass-to-Glass Movable Transom Clamps allow the rotation of a movable transom off of an inline fixed glass panel. To assure balanced movement the Clamp must be centered on the transom. 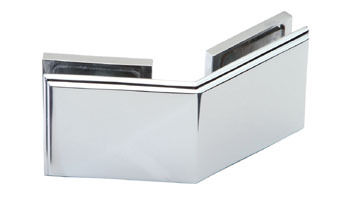 Maximum movable transom size is 16" x 30" (406 x 762 mm). 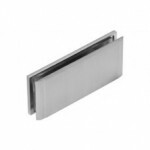 CRL Square 135 Degree Glass-to-Glass Clamps have sharp corners. 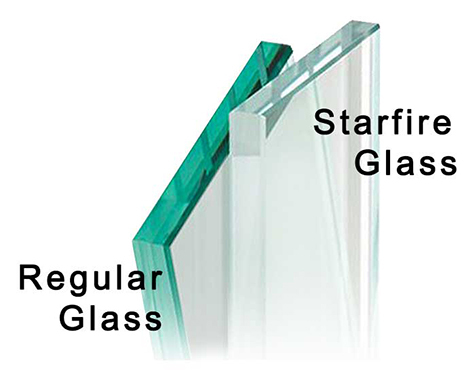 The glass can be mitered or flat edged. They are designed to join two panels at 135 degrees. These Clamps have many uses, and are typically utilized in the fabrication of custom showcase displays, trophy cases, partitions, and 'all-glass' enclosures. 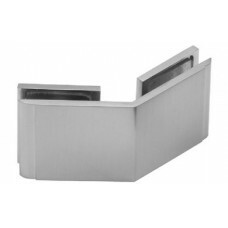 Available in a variety of popular finishes and styles to match designer hardware. Made of solid brass, these Clamps are engineered to remain beautiful for years with proper care and cleaning. Drawings and templates are available. The CRL Rounded Clamp with Horizontal Leg is primarily used where the desired mounting point is further away from the edge of the tile or wall. 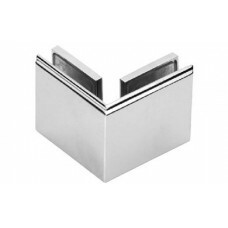 The rounded shape of the clamp is ideal for matching similar bathroom geometrical shapes. 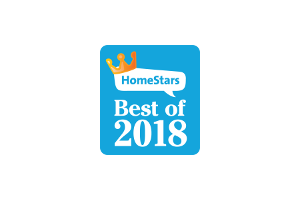 Stocked in six popular finishes, with custom finishes available. 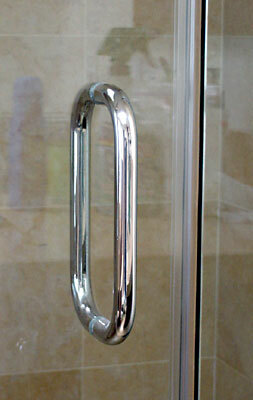 The Rounded Clamp with Horizontal Leg is for use with 3/8" and 5/16" (10 and 8 mm) thick tempered glass. No glass fabrication is required for the Clamp. The CRL Tall Base Glass Clamp has an exceptionally high 1" (25 mm) base, thus allowing a large gap between the glass and mounting surface if desired. While primarily for ceiling mount applications, this Clamp may mount to other surfaces as well. 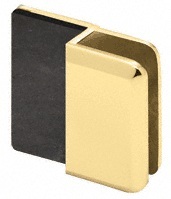 The Tall Base Glass Clamp is constructed of heavy-duty solid brass, and is stocked in six popular finishes. Custom finishes are available. 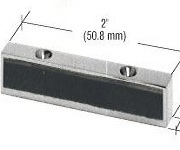 This Clamp is for use with 3/8" or 5/16" (10 or 8 mm) thick tempered glass. 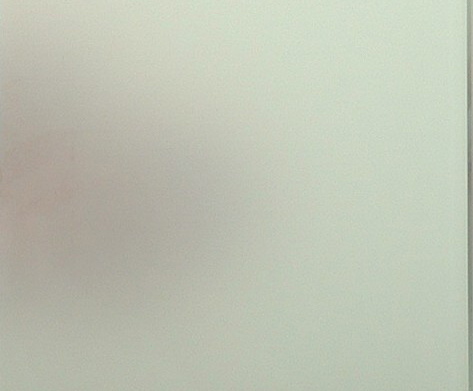 A 3/4" (19 mm) diameter hole is required in the glass. The Square Clamp with Horizontal Leg is primarily used where the desired mounting point is further away from the edge of the tile or wall. 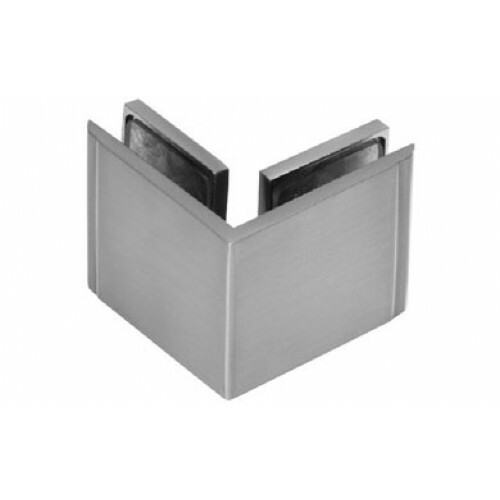 The square shape of the Clamp is ideal for matching popular CRL Hinge Series such as Geneva, Vienna, Victoria, Concord, and Cardiff. Stocked in six popular finishes, with custom finishes available. The Square Clamp With Horizontal Leg is for use with 3/8" and 5/16" (10 and 8 mm) thick tempered glass. No glass fabrication is required for the Clamp. 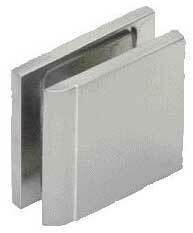 CRL Melbourne Series Wall Mount Brackets are designed to work with 5/16" to 1/2" (8 to 12 mm) thick glass. Can also be used as a horizontal shelf bracket. 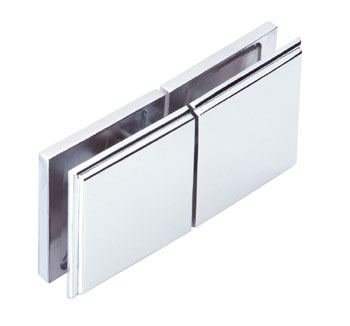 They match the configuration of many of our most popular hinge and clamp series. They feature square corners and edges in several decorator finishes. Mounting screws are not visible. 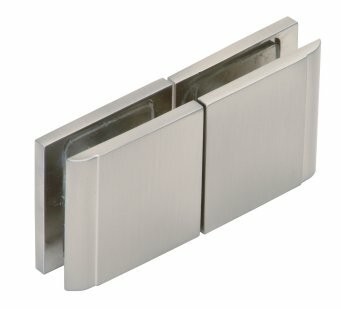 A truly stylish way to attach glass to walls.